Presqu'ile is one of the most outstanding natural areas on the lower Great Lakes. The park is well known among naturalists as a viewpoint for bird migration, but is less well known for its significant botanical attributes. Presqu'ile is notable for the remarkable diversity of plant communities contained in its relatively small area. On a short walk, a visitor to Presqu'ile can move through habitats ranging from open sandy beach to dense coniferous forest. Numerous regionally and provincially significant plant communities are present and still in relatively good condition, allowing a rare glimpse of lake Ontario shoreline habitats similar to those present before European settlement. The geology and geomorphology (see Geology and Formation of Presqu'ile) have played a major role in shaping Presqu'ile's plant communities. The diversity of successional stages and moisture regimes associated with the ever-changing sands of the tombolo results in substantial floral diversity. Sand beach, dune, interdunal slacks (pannes) and old beach ridges are all well represented in the park and each of these formations supports specialized plant communities. Areas on High Bluff Island and the former Presqu'ile island where the bedrock is exposed or near the surface support a few species typical of limestone outcrops. In the forested areas of the former island, the presence of drier forest is often associated with deeper sand deposits over the limestone bedrock, while the poorly drained areas typically have shallower soils. Lake Ontario has a distinct moderating effect on the climate of Presqu'ile. This moderation of temperature significantly affects the flora and fauna of Presqu'ile, which includes species with both northern and southern affinities. The cold waters of Lake Ontario are slow to warm in spring and early summer, making Presqu'ile distinctly cooler than surrounding areas away from the lakeshore. Many locally rare or uncommon plant species which are more typical of areas to the north of the park are thus able to survive at Presqu'ile. The conifer forest in The Fingers and the hemlock - red maple swamp forest in Jobes' Woods are the areas where Presqu'ile's northern character is most evident. Autumn and early winter temperatures at Presqu'ile are warmer than nearby inland sites because the lake slowly releases the summer's heat as it cools. This moderation of winter temperatures is likely an important factor explaining the presence at Presqu'ile of a number of southern plant species which are at or near their northern range limits. Presqu'ile's habitats are here divided into eight major community groupings: sand beach, panne, dune, conifer-dominated forest on low sand ridges (The Fingers), marsh and bay complex, forest over limestone bedrock, old field and thicket on limestone bedrock, and conifer plantation. Detailed descriptions of the vegetation in each of these community groupings are given below. Just over three kilometres of sand beach border Popham Bay on Presqu'ile's western edge. A very narrow strip of sand beach is also present, at times of low water levels, north of Indian Point on the Presqu'ile Bay shoreline. Most of the northern portion of the western beach is raked through the summer to remove aquatic plants and algae which have washed ashore. This process prevents the formation of natural plant communities and alters the patterns of sand deposition so that new foredunes do not develop. Sand deposition on the beach occurs at a very rapid rate. Old photos suggest that 80 metres of beach have developed from 1949 to 1996. Had beach raking not been carried out, new foredunes would have developed on the beach, behind which a substantial area of panne communities would have formed. A small portion of beach at the northern end and slightly larger portion at the southern tip have been left unraked. The northern "natural beach" has developed a natural beach and dune vegetation communities and a rudimentary panne behind the foredunes is forming. The southern "natural beach" has been invaded by Phragmites grass. The north end of the beach supports a provincially rare dry beach community dominated by sea-rocket (Cakile edulenta var. lacustris, endemic at the varietal level to the Great Lakes), cocklebur (Xanthium strumarium), and wormwood (Artemesia campestris). Plant growth in this area is rather sparse. A greater diversity of plants is found at the south end of the beach, near Owen Point, than at the north. This is probably due to richer soil associated with a greater deposition of algae and bird droppings from the waterbird colonies on near-by High Bluff and Gull Islands. While the interior of this community is dominated by willow (Salix) and Phragmites the shore edge is naturally highly dynamic. Species composition and the extent of vegetation changes from year to year with fluctuation in the lake level and on a slightly slower scale as the beach width increases due to sand deposition. As a result of the dynamic nature of the beach and the variety of seeds brought in by wave action, birds and park visitors, a diversity of weedy alien species occurs with the native beach vegetation. Some of the common alien species of the southern beach are barnyard grass (Echinochloa crus-galli), pale smartweed (Polygonum lapathifolium), lamb's-quarters (Chenopodium album) and tumble mustard (Sisymbrium altissimum). Less commonly common garden plants such as tomato (Solanum lycopersicum) and sunflower (Helianthus sp.) can also be found here. Additionally many weeds rarely collected in eastern Ontario (eg. Panicum dichotomiflorum, Aster brachyactis, Cleome hassleriana, Datura sp. and Conyza ramosissima, not previously collected in Canada) have been found at the south end of the beach. Most of these persist for only one or a few years before disappearing. Native species form the majority of vegetation on the open beach. Common native species among the diverse assemblage of herbs include rice cut-grass (Leersia oryzoides), beggar's-ticks (Bidens cernua and B. frondosa), rushes (Juncus spp. ), nut-sedges (Cyperus spp.) and cursed crowfoot (Ranunculus sceleratus). Along the small ridge between the Owen Point marsh and the beach, a dense stand of willows (Salix spp., mostly S. exigua) and common reed-grass (Phragmites australis) has developed since 1980. This community is advancing toward the water's edge. On the beach side of the small ridge, many young willows and cottonwoods occur with the herbaceous species of the beach. The pannes are flat, wet and largely open sandy areas present on either side of the main park entrance road. Smaller areas of panne habitat are also present around the edges of The Fingers. 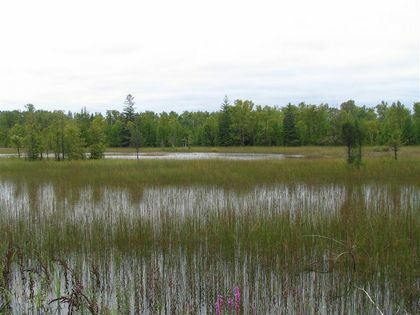 Panne habitats are very rare in Ontario, being essentially restricted to Great Lakes shorelines. Human activity has further reduced their naturally limited distribution. Presqu'ile's pannes contain the park's most significant plant communities, and are outstanding for their size, relatively good condition and diversity of rare and uncommon species. Several factors have prevented the formation of forest on the pannes. The sand deposits in this area are very recent (under 200 years old for the area west of the main road) and the infertile, alkaline sand discourages immediate tree growth, thus forests have not had time to develop. Annual or periodic flooding associated with fluctuating lake levels likely also limits tree growth, as the water table is only about 30 cm above or below the ground level. Vegetation patterns are complex on the pannes and with slight differences in moisture there may be substantial differences in plant species composition. In the driest areas of the panne, little bluestem (Schizachyrium scoparius) and Canada bluegrass (Poa compressa) tend to be dominant herbs. Associated with them are variegated and hybrid horsetail (Equisetum variegatum and E. x trachyodon), bearberry (Arctostaphylos uva-ursi), tufted panic grass (Panicum acuminatum), gray goldenrod (Solidago nemoralis), ebony sedge (Carex eburnea) and the nationally rare bushy aster (Aster dumosus). The nationally rare three-awn grass (Aristida longespica), which is not known from any other site in eastern Ontario, is fairly common in association with little bluestem in the southeast portion of the panne. Common juniper (Juniperus communis), and small white cedar and red cedar (Juniperus virginiana) often cover 25 percent or more of the ground in drier areas, and cottonwood, white birch and white spruce are scattered fairly commonly. In the wettest open pannes, those areas which flood annually, plant diversity is reduced. Twig-rush (Cladium mariscoides) is generally strongly dominant, with Baltic rush (Juncus balticus) of secondary importance. Purple loosestrife (Lythrum salicaria), an alien species well known for its invasive qualities, is very common in this type of association. Shrub cover is generally limited in these associations (if undisturbed), but scattered willows and nannyberry (Viburnum lentago) may be present. In some areas of intermediate moisture along the edges of seasonal ponds, spikerushes (Eleocharis spp.) and ensheathed dropseed (Sporobolus vaginiflorus) are dominant. Near the Beach Two and Fingers road entrances, beak-rush (Rhynchospora capillacea) and the nationally rare nut-rush (Scleria verticillata) are codominants. The open pannes support a spectacular array of showy flowering species which, while not generally community dominants, are nonetheless common. Most of these species flower late in the summer with the peak flowering period on the pannes coming from mid-August to mid-September. Common showy species thus far not mentioned include false dragonhead (Physostegia virginiana), grass-of-parnassus (Parnassia glauca), narrow-leaved and purple gerardia (Agalinis tenuifolia and A. purpurea), Kalm's lobelia (Lobelia kalmii), ladies'-tresses (Spiranthes cernua and S. romanzoffiana), fringed gentian (Gentianopsis crinita), closed gentian (Gentiana andrewsii) and bluets (Hedyotis longifolia). The last flowers in June. In the past the extreme rarity and significance of the pannes were not understood by park managers. As a result, large areas of the pannes were destroyed or altered by construction and tree planting. The park office, maintenance yard, park store, beach access roads and parking lots were all constructed over panne communities. Since 2001 steps have been taken to reverse the effects of some of this development. The picnic shelters near the park store were removed and much of that area is no longer mown. The area north of the park store in particular has reverted to a panne community which contains the regionally rare meadow spikemoss (Selaginella apoda). Large areas of panne west of the main road, destroyed in the 1960s to create beach parking lots, are obvious today as dense wet thickets of silky and red-osier dogwood (Cornus obliqua and C. stolonifera), willows and nannyberry. Canada bluejoint (Calamagrostis canadensis), marsh fern (Thelypteris palustris), silverweed (Potentilla anserina), wooly sedge (Carex lanuginosa) and marsh St. John's-wort (Triadenum fraseri) are common herbs of these sites. The dense growth of young white cedars around the dumping station is also likely the result of past human disturbance. A major problem in large areas of the pannes was the spread of Scots pine and white spruce from planted trees. If left unchecked, the shading caused by these trees will destroy the native panne communities. Removal of these trees is absolutely essential if the rare panne communities are to be preserved. Scots Pine removal was initiated in January 2009 and by Fall 2014 much of the Scots Pine to the east and west of the main road between the front gate and the Park Store access road had been removed. Presqu'ile contains good examples of a variety of sand dune communities which are rare in Ontario and largely or entirely restricted to the shorelines of Lakes Erie and Ontario. The low dunes along the west side of the panne (around the beach parking lots) are mostly covered with open cottonwood groves, where tree cover is around 50 percent. In the more stable portions of this area, Canada bluegrass is the dominant understory herb and starry false solomon's-seal (Smilacina stellata) and poison-ivy (Rhus radicans) are common, as are woody species such as riverbank grape (Vitis riparia), heart-leaved willow (Salix cordata), soapberry (Shepherdia canadensis) and common juniper. Alien species such as quack grass (Elymus repens) and white sweet clover (Melilotis alba) occur in the more disturbed portions of the dunes. Where the sand is less stable and open blowouts occur, wormwood, Canada wild-rye (Elymus canadensis) and sand dropseed (Sporobolus cryptandrus) become more common. The regionally rare beach (marram) grass (Ammophila breviligulata), is also locally common on the beach side of the dune where it has been transplanted for dune stabilization from a small native population at the north end of the beach. In this area, heart-leaved willow, riverbank grape and cottonwood occur sparsely along with beach grass and wormwood. Red pine were planted about 1980 in some sections of the western dune ridge, particularly at its extreme south end. Removal of these trees would stop the damage they are causing to the rare dune plant communities through shading and deposition of needles. The dunes on the eastern side of the tombolo are higher than those on the west. Portions of these dunes, especially on the east facing slopes, are fairly densely forested with white cedar and white spruce. Most of the eastern dunes are, however, quite open with large blowouts present. The vegetation is similar to that of the more open sections of the western dunes with wormwood, sand dropseed and Canada wild-rye common. On the tops of some dunes, dense growth of common juniper, red cedar, white cedar and riverbank grape occurs with scattered cottonwood trees. With the construction of walkways across the dunes, trampling of dune vegetation between the beach parking lots and the beach has been reduced. On the eastern dunes, visitor use is much lower, but is sufficient to damage the sensitive and rare dune communities. Park visitors should avoid walking on the dunes to minimize disturbance to this significant area. The Fingers are a series of low, sandy, former beach ridges which extend southeastward into the marshes of Presqu'ile Bay. The cooling effect of Lake Ontario in summer has allowed the development of an unusual and significant conifer dominated forest which is very northern in aspect. The area is the best example of coniferous forest along the shoreline of Lake Ontario and the least disturbed forest of the Presqu'ile peninsula. White cedar, white spruce and white pine are dominant trees with white birch, balsam fir, tamarack and trembling aspen also occurring commonly. A few naturally occurring red pines, which are quite rare along the Lake Ontario waterfront, are also present in The Fingers. Towards the ridges' terminal ends and in wet depressions between ridges, forest density decreases and conifers are replaced by poplars (Populus spp.) and red and black ash. Shrub cover, including red-osier and silky dogwoods, willows and nannyberry is generally quite heavy in these wet areas. The drier, coniferous forests of The Fingers often have little herb cover in the understory, due to low light levels and perhaps also heavy deer browsing. Ebony sedge (Carex eburnea) is the most abundant understory species through much of The Fingers. Other ground flora includes wood-ferns (Dryopteris spp. ), starflower (Trientalis borealis) and twinflower (Linnaea borealis). A number of uncommon northern species are present, such as greenish-flowered pyrola (Pyrola chlorantha), one-flowered pyrola (Moneses uniflora), early coralroot (Corallorhiza trifida) and adder's-mouth orchid (Malaxis monophyllos). The Presqu'ile marsh complex is the largest and least disturbed coastal wetland on Lake Ontario west of Prince Edward County, and it is designated as provincially significant under Ontario's wetlands evaluation framework. The marsh complex is especially notable for the diversity of communities it contains. This diversity is largely attributable to the variety of water depths and microclimatic conditions produced by the series of former beach ridges (The Fingers) which penetrate the marsh area. The communities of the marsh complex can be divided into four main types dominated by: 1) cattails, 2) sedges and bulrushes, 3) open or shrubby old beach ridges, 4) open water with submergent and floating-leaved species but limited emergent plant growth. In the deeper water with organic substrates, broad-leaved and narrow-leaved cattail dominate the marshes. Associates on the cattail mats include jewelweed (Impatiens capensis), marsh bellflower (Campanula uliginosa), marsh St. John's-wort, Canada bluejoint, marsh bedstraw (Galium palustre) and broad-fruited bur-reed (Sparganium eurycarpum). Extensive sedge meadows are found in shallow, seasonally or permanently flooded depressions between The Fingers. In some areas sedges have formed floating mats of vegetation with some fen or bog affinity. The various sedge dominated meadows are, in botanical terms, relatively unexplored. A variety of sedge species are present, including (Carex aquatilis, C. stricta and C. utriculata). Bulrushes (Scirpus acutus and S. pungens) are also locally important. Associates include Canada bluejoint, narrow-leaved willowherb (Epilobium leptophyllum), marsh bellflower and three-way sedge (Dulichium arundinaceum). Scattered willows, dogwoods and meadowsweet (Spiraea alba) are found in the drier areas where low, old beach ridges occur within the marsh. Plant communities in these areas could reasonably be classified as pannes, but are generally not as diverse and contain fewer rare species than the pannes along the main park road. Herbaceous species include silverweed, Canada bluejoint, marsh bellflower, marsh St. John's-wort and marsh fern. A variety of aquatic submergent communities are found within the marsh and bay, generally where a layer of organic material overlies the sandy substrate. Between the cattail mats in the marsh, in areas of open water, bur-reeds (Sparganium eurycarpum, S. chlorocarpum, S. minimum), grass-leaved pondweed (Potamogeton gramineus) and arrowhead (Sagittaria spp., mostly S. latifolia) occur commonly while pickerelweed (Pontederia cordata) is found locally. European frog-bit (Hydrocharis morsus-ranae), an invasive, floating-leaved alien species is locally abundant in open water in the marsh and is likely having a negative impact on native species due to its dense growth. Submergent and floating communities around the edges of the marsh include yellow pond-lily (Nuphar variegatum), white water-lily (Nymphaea odorata) and submergent species such as pondweeds (Potamogeton spp. ), flexible naiad (Najas flexilis), tape-grass (Vallisneria americana), common bladderwort (Utricularia vulgaris), water-milfoil (Myriophyllum verticillatum) and coontail (Ceratophyllum demersum). In water depths around one metre over a sandy substrate, sparse growth of softstem bulrush (Scirpus validus) and wild rice (Zizania palustris) occurs with associated submergent species including pondweeds, tape-grass and water-weed (Elodea canadensis). Forests on the former Presqu'ile Island are quite varied in age, species composition and moisture levels, however certain generalizations apply. The forests of the former island tend to have a cooler than normal microclimate, due primarily to the higher than average humidity and moderation of summer temperatures associated with proximity to Lake Ontario. There is also a tendency toward moist conditions due to the poor drainage on shallow sand deposits over limestone. The cool, humid microclimate of Presqu'ile is reflected in the interesting flora found in forests on the former Presqu'ile island. Hemlock, yellow birch and especially striped maple (Acer pensylvanicum) are unusually common. Species such as striped maple, wood sorrel (Oxalis montana), New York fern (Thelypteris noveboracensis), northern beech-fern (Phegopteris connectilis), hay-scented fern (Dennstaedtia punctilobula) and hobblebush (Viburnum lantanoides) are rare or uncommon locally and are more typical of the southern Canadian Shield around Algonquin Park or the northcentral Appalachian mountains. The latter two species, however, have not been located in the park in recent years. On the sites with better drainage, as occurs on the deeper sand deposits over limestone, deciduous trees predominate. 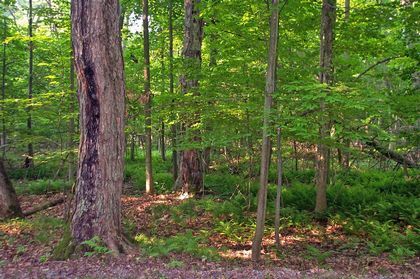 In mature communities, sugar maple, red oak, beech and hemlock are the dominant tree species. Associates include black cherry, white birch, basswood and white ash. Common shrub species include beaked hazel (Corylus cornuta), maple-leaved viburnum (Viburnum acerifolium) and common blackberry (Rubus allegheniensis). Understory herbs vary with soils, moisture levels and microclimate. Sedge species (especially Carex pedunculata, C. arctata and C. communis), lady-fern (Athyrium felix-femina) and intermediate wood-fern (Dryopteris intermedia) are common in most wooded areas. In the richer sites herb species include zig-zag goldenrod (Solidago flexicaulis), wild leek (Allium tricoccum), blue cohosh (Caulophyllum thalictroides) and meadow horsetail (Equisetum pratense). In well-drained sites with somewhat acidic soil, wild sarsaparilla (Aralia nudicaulis), shinleaf (Pyrola elliptica), starflower (Trientalis borealis) and partridgeberry (Mitchella repens) are typical understory species. The western end of High Bluff Island supports a forest type unique in the park. Very mature sugar maple, red oak and black maple make up the tree cover. Dominant understory species include Virginia waterleaf (Hydrophyllum virginianum) and cut-leaved toothwort (Cardamine concatenata). 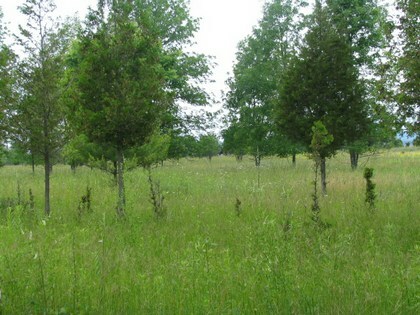 The site is significant due to the age of the trees, the uncommon species association and the rarity of mature forest on Lake Ontario islands. The forest has been disturbed, however, by previous heavy deer browsing and recent cormorant nesting. The site was probably also heavily grazed by cattle and selectively cut in the past, as the tree cover is rather sparse and there are few intermediate aged trees. Most of the oldest trees have died since 2000, succumbing to age, weather and an increased nutrient load from cormorant droppings. In the wetter areas, forest associations include red and black ash, hemlock, white cedar, yellow birch and red maple. Mountain maple (Acer spicatum), winterberry holly (Ilex verticillata) and highbush cranberry (Viburnum trilobum) are common shrubs, while sensitive fern (Onoclea sensibilis), ostrich fern (Matteuccia struthiopteris), wood-ferns, fowl manna-grass (Glyceria striata) and rough goldenrod (Solidago rugosa) are a few typical herbs. Clearing of the land for farming and other human activities has resulted in a variety of forest ages and successional stages at Presqu'ile. Much of the forest which remains is fairly mature, exceeding 75 years of age. Exceptionally mature areas, where some trees are 100 or more years old, occur on High Bluff island, at the northeastern end of the campground, south of Jobes' Woods Trail, and around the entrance to Jobes' Woods Trail. These old growth forests are characterised by pit and mound topography that support a diverse herbaceous flora as well as vernal pools in spring. These very mature areas are almost contiguous, being separated by areas of forest which are only slightly less mature. Presqu'ile's White-tailed Deer population was extremely large for the park's size between 1985 and 2006. Deer were having a huge impact on forest vegetation and most of the understory of Presqu'ile was destroyed during those years. A number of forest plant species listed as common by Darbyshire (1978) were difficult to find by 1996 and some species which have been collected in the past now appear to be absent. Deer reduction programs, carried out from 2001 to 2006 has reduced the population of deer enough to allow the understory to start to regenerate as of 2008. This category includes all currently open areas (tree cover under 50 percent) which have been cleared for agriculture or development. The pannes are not included in this category because they are maintained in an open condition by natural processes. Moisture levels in the old fields range from wet and seasonally flooded to quite dry. Dry old fields around the picnic areas, campgrounds and the Calf Pasture are dominated by non-native pasture grasses, primarily timothy (Phleum pratense) and Kentucky bluegrass (Poa pratensis). Other common herbaceous species of old fields include Canada Goldenrod (Solidago canadensis) and weedy alien species such as quack grass, wild carrot (Daucus carota), common St. John's-wort (Hypericum perforatum) and sweet white clover. Wetter old fields tend to have a greater cover of young trees than do dry fields, with red ash strongly dominant. Trembling aspen and white cedar are common associates, as are shrubs such as red-osier dogwood, nannyberry, willows and meadowsweet. Herbaceous cover includes grasses such as Canada bluejoint and redtop (Agrostis stolonifera), sedges (Carex spp. ), sensitive fern and late goldenrod (Solidago gigantea). Some areas of old field have developed into thicket communities with a substantial cover of shrubs. On the drier sites red raspberry (Rubus strigosus), red cedar, common juniper and choke cherry (Prunus virginiana) are prevalent. Trees include red ash, white elm, white cedar, trembling aspen and domestic apple (Malus pumila). The extensive mown areas in the park are primarily composed of bluegrass species (Poa spp.) and weedy alien species. Mowing has been reduced since 2001, both in pannes areas as noted above and along the back of the Day Use areas. The naturalization of these areas is being facilitated by the planting of native tree and shrub species which have been raised from park seed sources in the park nursery. Conifer plantations of Scots pine, red pine, white spruce, white pine, European larch, Norway spruce and jack pine occur on the limestone area. They vary in age from about 15 years to approximately 40 years. The youngest trees are in semi-open stands with herbaceous old field species while the more mature, unthinned plantations have canopies that produce dense shade. The dense coniferous plantations are extremely depauperate ecologically, being virtually lifeless in comparison with adjacent natural forest. So little light reaches the ground that there is essentially no understory vegetation. The lack of understory and limited spatial diversity produced by rows of even aged trees mean that only a few bird and mammal species find the plantations to be attractive habitat. Substantial thinning (removal of 50 percent or more of the trees) of these plantations would allow for the formation of more natural plant communities, greatly enhancing the plantations' floral and faunal diversity. Since 2006 even this habitat has been invaded by the invasive alien species, common buckthorn (Rhamnus cathartica). While it is not impacting much natural habitat in the plantations, it does become a seed source for growth in the more natural forest. A control program for this plant is underway in these areas (2014). Darbyshire, S. (1978). Vegetation and Flora of Presqu'ile Provincial Park. MNR. 71pp.